On Friday, 4/11, Bucks County District Attorney Matthew Weintraub announced that a police officer will not face criminal charges after shooting suspect in custody last month. Weintraub wrote in a letter to New Hope Police Chief Michael Cummings, "After careful consideration, I have determined that [the officer's] shooting of arrestee Brian Riling on March 3, 2019, was neither justified, nor criminal, but was excused." It happened inside a holding cell at the the New Hope Borough station. It was caught on surveillance video. The suspect, Brian Riling, was taking off his belt when a small baggie fell to the ground. He tried to quickly step on it, but officers saw it. The suspect and two officers begin to struggle, and one officer yells out "taser, taser." He reached to his side, but instead of pulling out the Taser, he drew his firearm. The officer then shot Riling in the stomach. The suspect recovered after a lengthy hospital stay. 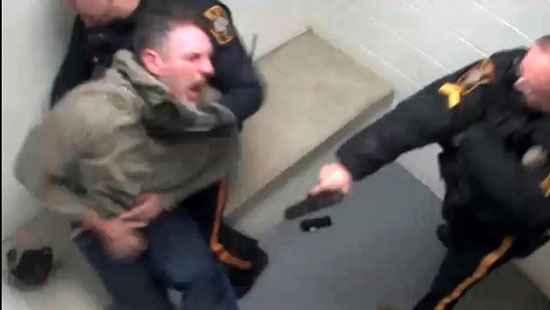 Weintraub said, "the officer honestly believed that he was using his taser when he shot Mr. Riling in the stomach." The officer had holstered both his gun and Taser on the right side, against department policy. The Taser should have been on the non-dominant side. The unidentified veteran officer retired on April 10th. 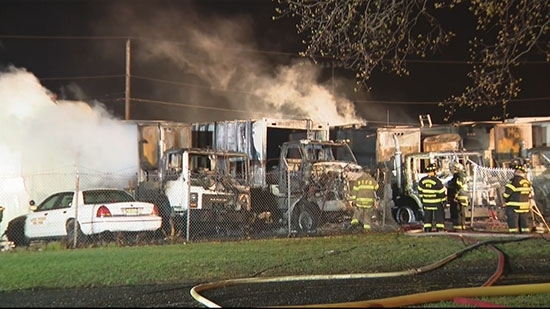 A fleet of trash trucks went up in flames overnight in Gloucester County. It happened just after 3 a.m. Saturday, 4/13, at the Mantua Public Works Building on the 400 block of Main Street. Five of the township's nine garbage trucks were destroyed by fire. No one was injured. Officials believe that a mechanical issue may has caused the fire. They also say there may be delays in trash pickups while the township works to replace their fleet. Philadelphia Police have taken a man into custody that may have connections to two shooting deaths in the Wissinoming section on Thursday, 4/11. Two people were arrested following a pursuit near Cottage and Bridge Streets on Friday night, 4/12. The vehicle in question was seen at the location of two shootings within an hour and just blocks apart of each other. The first shooting happened around 3 p.m. Thursday on the 4700 block of Benner Street. Two rival gangs opened fire on each other. 56-year-old mechanic Michael Gleba was hit by a stray bullet while working in his shop Northeast Speedometer Service Auto Shop. He was struck in the stomach and pronounced dead at the hospital. The second incident happened shortly after on the 5500 block of Torresdale Avenue. The suspect has not been identified.